Tropical Darwin has the best climate in Australia, most of the time! When is the best time to visit tropical Darwin? Located in the far north of Australia, Darwin is the capital city of the Northern Territory. Affectionately known as the Top-End, Darwin is easily accessible from all major Australian cities and only a short flight to Bali and Singapore. Darwin enjoys a tropical climate. Most Top-Enders consider we have only two seasons in our weather cycle each year – a ‘wet’ and a ‘dry’ season, however I believe our ‘build-up’ is a season of it’s own. In the Top-End, the yearly weather cycle is more than just ‘wet’ and ‘dry’, and includes a period ‘in-between’ we refer to as ‘the build up’. The ‘build up’ usually occurs a few months before the wet season presenting days of high humidity, dark grey thunderous clouds, but rarely rains. Usually starts around October and runs though into December or until the monsoonal rains starts to fall. The ‘dry’ season is the weather all Top-Enders live for. Legend has it that the appearance of the first dragonfly heralds the end of the ‘wet’ and celebrates the incoming ‘dry’ season. Of course, most of you know that this is a stretch of the truth and that dragonflies are flitting about all year round! Darwin locals watch for the indicators of oncoming temperate weather and are quick to claim the first sighting of the ‘dry’ season heralders, the dragonflies. Just a bit of fun we have with our visitors but it’s true, one morning you’ll wake up to the cool weather change and hear us all exclaim ‘ahh, the ‘Dry’ is here’! Strange as it may seem but it’s like flicking a switch. Almost instantly, the humidity is gone, the temperatures are mild and the cool ocean breezes create the true tropical living that we all love. The ‘dry’ season is between May and September and it’s a time when the Top End of Australia experiences low humidity and almost no rainfall. Expect beautiful balmy winter days 18 – 30 degrees, clear blue skies, warm tropical nights and beautiful sunny days. During the ‘dry’ season many waterholes and creeks dry up completely, and once lush grasslands of the Top End, turn dry and brown. Bushfires are common in the Top End late in the ‘dry’ and through the ‘build up’. These fires are often started by Aboriginal people, continuing a practice going back many thousands of years of land management (to try to prevent huge bush fires) and to drive animals so they can be caught for food. The ‘wet’ is when the rains come. Warm, moist northwest winds bring high humidity, spectacular storms and monoonal rains to the Top End. The humidity ‘builds-up’ and the air is hot and humid with heavy grey clouds, thunderous clouds and spectacular lightening displays are the lead up to the torrential downpours of the monsoonal rains. Once a storm downpour hits, temperatures drop magically with the rain but then the humidity ‘builds up’ again until the next storm event. If you can stand a little humidity, visiting the Top End at this time of year is very rewarding. The waterfalls are magnificent, waterlillies are blooming and the rock pools are at the perfect temperature to swim. It is the time of year that birds and wildlife are very active with many nesting or on their migration journeys. For visitors, travelling the Top-End is best during the start of the ‘dry’ and towards the end of the ‘dry’ season. It’s still warm but not too steamy. The waterways are full of water and haven’t started to dry out. There’s great fishing during the ‘run-off’ resulting from the late rains during the ‘wet’ season and there’s an abundance of birds and other wildlife moving around. 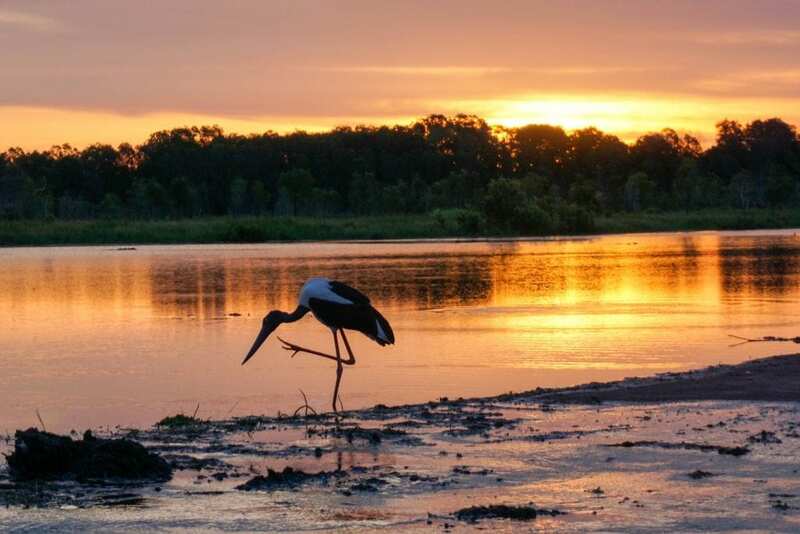 A great time for photographers, bird-watchers and wildlife lovers. Make sure you go out to Fogg Dam for an amazing show of birds. Temperatures are starting to warm up during the day but the nights are still cooler. The Mindil Markets and Deck Chair Cinema is still on so that you can enjoy the balmy tropical evenings. 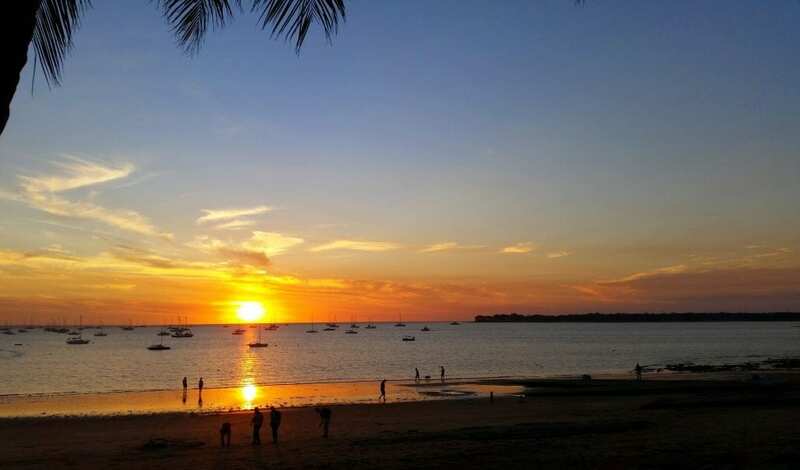 Sunsets overlooking the beaches are gorgeous and August in particular, is the start of the Darwin festival. It’s the right time to head into Litchfield Park and other National Parks as most of the roads have opened after the ‘wet’ and everything is lush and green. It’s a great time to visit the Top End. Like most Top Enders, I enjoy the excitement of the wet season with its spectacular lightening storms and refreshing downpours. The ‘wet’ is when the Top End is at it’s best! Travelling to Darwin or the Top End during the wet will give you some definite ‘off season’ advantages. Yes, it is a little humid, but there are some amazing sights to see that can’t be seen at other times of the year. The wetlands are full and often overflowing, waterfalls are spectacular and at their best. Many birds migrate from the northern hemisphere in the build-up of the wet season and when the rains start waterbirds head to the wetlands to breed. It’s a unique place ‘our Territory’! Be adventurous, visit Darwin and enjoy our Top End like a local. Have you been to the Top-End yet? Which season will you choose to visit?